Oil Could move in either direction. Take your pick. Sensex Will be a fight between Bulls and Bears. Choose your sides. UP elections Cash will continue to reign supreme. Cash is King. Demonetisation People still won't know what actually happened. Real estate I am still thinking on this one. Bold predictions indeed. Hey, at least they aren't in italics! We prefer useful recommendations over merely accurate forecasts. We aim to recommend stocks at such a low price that even a slight improvement in fundamentals will shoot the prices up, letting subscribers exit at a good profit. Agreed that not all stocks go up in price a great deal. Some are genuinely in trouble and may remain sideways or even fall still lower. However, if we get our stock selection right and try to buy only those stocks that have a great probability of recovering in the medium term, we can end up with great returns. I make no attempt to forecast the general market - my efforts are devoted to finding undervalued securities. Forecasting is fraught with risks. Too many variables affect the outcome. And the more the variables, the more the margin for error and the less useful the forecast. This is why we prefer to analyse individual securities and dig deep into their business fundamentals. Ground rule number six: I am not in the business of predicting general stock market or business fluctuations. If you think I can do this, or think it is essential to an investment program, you should not be in the partnership. Of course, this rule can be attacked as fuzzy, complex, ambiguous, vague, etc. Nevertheless, I think the point is well understood by the great majority of our partners. We don't buy and sell stocks based upon what other people think the stock market is going to do (I never have an opinion) but rather upon what we think the company is going to do. The course of the stock market will determine, to a great degree, when we will be right, but the accuracy of our analysis of the company will largely determine whether we will be right. In other words, we tend to concentrate on what should happen, not when it should happen. Since demonetisation, the research team has been hunting for profitable ideas in sectors like pharma, financials, microfinance, auto etc. Their goal is simple: to get you great recommendations. Honest, dispassionate, useful recommendations to help you create wealth. And we promise to keep doing this for you in 2017. Wishing you a very happy 2017! The market continued to remain volatile for the year 2016. Maximum drawdown is a measure of the percentage change of a stock's high to its low. 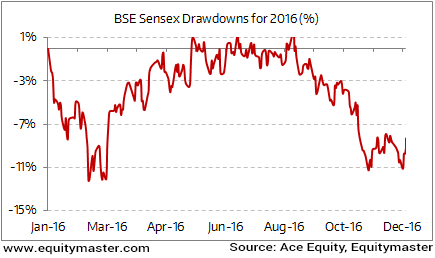 The Sensex during the year saw a maximum drawdown of 12% during Feb-2016. This volatility that we saw once again indicated that volatility is central theme is the stock markets. It creates an opportunity for those who are willing to be patient. Patience and a longer time horizon are crucial sources of sustainable advantages that one must employ to be successful in the markets. Prime Minister Narendra Modi with much enthusiasm launched 'BHIM: Bharat Interface for Money'. This is another option for users to make or receive payments. The initiative is another step towards a less cash economy. It is built by the National Payments Corporation of India (NPCI). While there have been numerous banks who have launched their own version of digital payments wallets. All of these based on the platform that is created by the NPCI. An Aadhaar-based payments system would be added to the app in the next two weeks. The prime minister in his speech stated that the app does not even require internet connection to work. The intention is to get increased adoption of digital means of transactions in the economy. Though, the implementation will be crucial to the success of this initiative. Vivek will be sending his petition to the President of India on 6th January 2017. Only six days remain. Sign the petition today and spread the word so that we get equal rights. The year 2016 was an action packed year for the global markets. It began with negative news flows from China. The world's second largest economy showed signs of weakening. 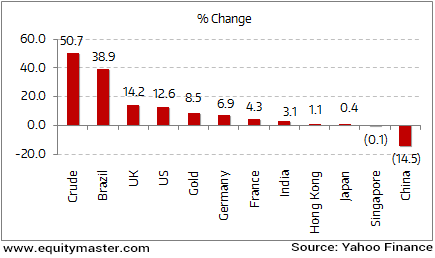 The global markets saw a sharp plunge in apprehension of a China slowdown. Over the rest of the year, major indices saw some volatility. The Chinese stock markets continued their slide downwards. Consequently, Shanghai index ended the year down 14.5%. The leading loser globally. It was a lukewarm year for Asian indices, while major western markets remained resilient to the surrounding global turmoil. The rest part of the year witnessed some key developments. Brexit, volatile commodity price, Donald Trump's shocking victory and so on. In the upcoming year, the whole world will be looking forward to the policies and actions of, Donald Trump. On the commodity front, the crude prices witnessed a sharp rally, after touching lowest levels of around US$ 26 (Brent oil per barrel). While gold prices surged by 8.5% in last one year. Marking its first annual gain in four years. On the domestic front. The Indian markets ended the year with gains of 3.1%. We saw exit of Raghuram Rajan from RBI; Indo pak surgical strikes, clearance of GST bill and so on. And finally came the demonetization. Modi's fight against black money. While the economy has been going through the after effects of demonetization, one will witness aftermath impacts during the 2017 too. This edition of The 5 Minute WrapUp is authored by Rohan Pinto (Research Analyst). Equitymaster requests your view! Post a comment on "'Bold' Predictions for 2017 (Sensex, Gold, GST, Demonetisation, and More!)". Click here! 4 Responses to "'Bold' Predictions for 2017 (Sensex, Gold, GST, Demonetisation, and More!)" NO ONE CAN PREDICT LIKE THIS.AWARD WINNING!! Idiotic,just to attract readers the title but, but, but..,rubbish.. It was great reading this edition especially Mr Pinto's predictions for 2017.The one on demonetisation actually broughyt a smile on my face.Warren Buffets comments were an eye opener.Thanks a lot. Why are you wasting everyone's time by writing such poor stuff. Common man always look up to you for knowledgeable information. If you are saying commodities you are listed above moves in either direction, then why are you calling it as prediction.